We are still chugging right along through the book of Genesis in our family devotion time. This has become a precious part of the evening for us. The four of us gather around and listen (or read) God's Word, and then discuss that passage. Some of the topics covered over these past two weeks have been unique in nature. While reading about Lot and his daughters, the realization of Lot being father and grandfather to his daughters children threw them for a loop. They had never been exposed to anything remotely similar to this situation. I was reading the passage almost holding my breath to see if they would pick up on the details. And they did... However, we were able to emphasize that was not what the Lord intended. One neat little side note. We typically read from the King James Version, which uses the word "peradventure" often. My kids have added that word to their regular vocabulary now, usually with a little giggle to follow. The events of Abraham are always amazing to read. Our family gets a little nerdy when we read through the genealogy of the Bible and typically pull out our huge timeline chart so we can keep up with who is alive at the same time or how old people were when they had kids. (This is the chart we have.) Little things like being over 100 and still having children are hard to fathom. But the discussions are so genuine! I love every minute of our time together in God's Word. With that said, I do not want to give any false impressions or lead anyone down a path of discouragement. Not every night looks as amazing as the above sounds! For the past two weeks, really almost 3 weeks, someone in my house has been sick. I'm talking the fever, pain, hacking cough - some kind of sick. So, some nights we have to stop for a break to let everyone go blow their noses, or run and get water to help with coughing. One night my husband was suffering with his sinus infection so severely, he fell asleep while we read. 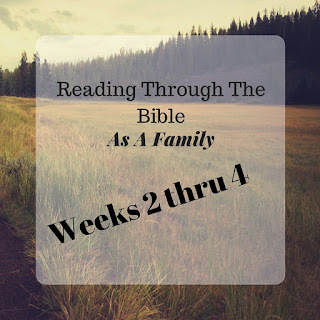 (Our youngest kept trying to keep him awake by asking questions...) One night none of us could even read out loud, so I brought my phone and had my Bible app read the dramatized version to us as we followed along. (That actually worked pretty well.) The past few nights we've only gotten through a single chapter each night. We have about 5 more chapters left in Genesis after 4 weeks of reading. At this same rate, it may take us quite awhile, but the discussions are what is important.